Co-authored with Michael T. O'Connor, published by Corwin Impact Leadership Series, June 2018. Co-authored by Alan Boyle and Alma Harris, published by Jossey-Bass, June 2014. What does it take to do more with less? How can you do better than before, or better than others? How do you turn losses into wins, near-bankruptcy into strong profitability, or abject failure into stellar success? The power of uplift enables any organization to do more with less, beat the competition, and perform better than ever. Leaders who uplift their employees’ passions, intellects, and commitments produce remarkable results. Featuring case studies of organizations as diverse as Shoebuy.com, Fiat, Dogfish Head Craft Brewery, Marks & Spencer, Cricket Australia, Burnley Football Club, and the Vancouver Giants, as well as world-leading educational systems, Uplifting Leadership provides tools for leaders to incorporate these performance-driving strategies into their own. For leaders who want their people to try harder, transform what they do, reach for a higher purpose, and stay resolute and resilient when opposing forces threaten to defeat them, Uplifting Leadership provides a path to better performance across any organization. Co-authored with Dennis Shirley, published by Corwin Publishing, September 2012. Deep and lasting educational reform doesn’t happen overnight, even in this fast and flexible 21st century. ​This example-packed sequel to The Fourth Way draws upon inspiring examples unearthed by brand new research to challenge educational leaders, teachers, and policy makers to put proven strategies to work promoting student learning and achievement and the high quality teaching that drives it. Co-authored with Michael Fullan, published by Teachers College Press, March 2012. The future of learning depends absolutely on the future of teaching. In this latest and most important collaboration, Andy Hargreaves and Michael Fullan show how the quality of teaching is captured in a compelling new idea: the professional capital of every teacher working together in every school. Speaking out against policies that result in a teaching force that is inexperienced, inexpensive, and exhausted in short order, these two world authorities―who know teaching and leadership inside out―set out a groundbreaking new agenda to transform the future of teaching and public education. Ideas-driven, evidence-based, and strategically powerful, Professional Capital combats the tired arguments and stereotypes of teachers and teaching and shows us how to change them by demanding more of the teaching profession and more from the systems that support it. This is a book that no one connected with schools can afford to ignore. A powerful and practical solution to what ails American schools. Action guidelines for all groups―individual teachers, administrators, schools and districts, state and federal leaders. A next-generation update of core themes from the authors’ bestselling book, What’s Worth Fighting for in Your School? Co-edited by Ann Lieberman, Michael Fullan, and David Hopkins, published by Springer, September 2010. The two volumes of the second edition of the International Handbook of Educational Change comprise a totally new, and updated collection of the most critical and cutting-edge ideas in educational change. Written by the most influential thinkers in the field, these volumes cover educational change at both the theoretical and practical levels. The updated handbook remains connected to the classical concerns of the field, such as educational innovation, reform, and change management, and also offers new insights into educational change that have been brought about by social change and shifting contexts of educational reform. Like the first best selling Handbook, this one will also undoubtedly become an essential resource for people involved in all spheres of education, from classroom teachers, teacher leaders and administrators to educational researchers, curriculum developers, and university professors. No other work provides such a wide-ranging and comprehensive examination of the field of educational change. Co-authored by Dennis Shirley, published by Corwin, August 2009. Co-edited by Michael Fullan, published by Solution Tree, September 2018. Change Wars is the third book in the Leading Edge series. The Leading Edge series unites education authorities from around the globe and asks them to confront the important issues that affect teachers and administrators the issues that profoundly impact student success. The experts contributing to this anthology do not prescribe one method to transact change. They embrace the mission, trusting that teachers and administrators the true change leaders will venture to the Leading Edge to embrace the challenges and opportunities that will guarantee the success of their students. The 13 contributors to Change Wars tackle these difficult questions by offering their own theories-in-action of educational change the changes they want, why they want them, and how they believe they can be brought about and sustained so readers can reflect on change in their own situations and perhaps find areas of broad agreement. Change Wars provides a comprehensive view of the challenges of education reform from system, district, and classroom standpoints and examines the many perspectives of effective reform and implementation. Change Wars contains more theory than On Common Groundand Ahead of the Curve. The contributors are largely researchers and not practitioners. The majority of the contributors focus on system change from a broader perspective than the classroom level. Co-authored by Dean Fink, published by Jossey-Bass, September 2005. ​Translations in Portuguese & all Nordic languages, Lithuanian and Chinese. In Sustainable Leadership, Andy Hargreaves and Dean Fink address one of the most important and often neglected aspects of leadership: sustainability. The authors set out a compelling and original framework of seven principles for sustainable leadership characterized by Depth of learning and real achievement rather than superficially tested performance; Length of impact over the long haul, beyond individual leaders, through effectively managed succession; Breadth of influence, where leadership becomes a distributed responsibility; Justice in ensuring that leadership actions do no harm to and actively benefit students in other schools; Diversity that replaces standardization and alignment with diversity and cohesion; Resourcefulness that conserves and renews leaders' energy and doesn't burn them out; and Conservation that builds on the best of the past to create an even better future. Published by Teachers College Press, May 2003. ​Translations in Spanish, Portuguese, Norwegian, Danish, Swedish, Brazilian Portuguese, and Chinese. This major commentary on the state of today’s teaching profession in a knowledge-driven world is theoretically original and strategically powerful―a practical, inspiring, and challenging guide to rethinking the work of teaching. Co-authored by Lorna Earl, Shawn Moore, and Susan Manning, published by Jossey-Bass, April 2008. The success of school reform measures greatly depends on the support and commitment of teachers. This book examines the realities of educational change from the frontline perspective of reform-minded teachers. It charts the perceptions and experiences of twenty-nine teachers in grades 7 and 8 from four school districts--showing how they grappled with such initiatives as integrated curriculum, common learning standards, and alternative modes of assessment. This book moves beyond the bandwagons of rhetorical change and examines how these changes work in practice for better and for worse. Authors Andy Hargreaves and Lorna Earl focus on how reform proposals have brought new complexities to teaching practice and why major investments of time and support are required if teaching innovations are to become lasting and effective. Most importantly, they highlight the intense emotional demands that school change imposes on teachers, and they outline practical strategies for helping teachers through the difficult transition process--thus ensuring that worthwhile reforms flourish and endure. Published by Teachers’ College Press and University of Toronto Press, 1994. Translations in Spanish, Norwegian, Portuguese, Swedish, Danish and Slovenian. ​'The rules of the world are changing. 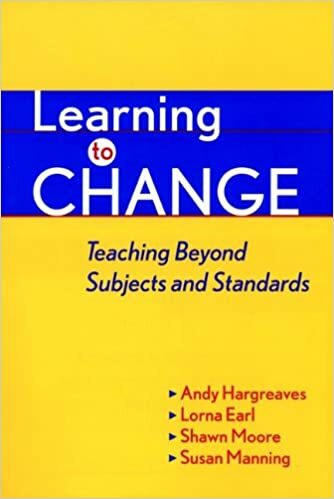 It is time for the rules of teaching and teachers' work to change with them' This is the challenge which Andy Hargreaves sets out in his book on teachers' work and culture in the postmodern world. Drawing on his current research with teachers at all levels, Hargreaves shows through their own vivid words what teaching is really like, how it is already changing, and why. He argues that the structures and cultures of teaching need to change even more if teachers are not to be trapped by guilt, pressed by time and overburdened by decisions imposed upon them. Provocative yet practical, this book is written for teachers and those who work with teachers, and for researchers who want to understand teaching better in the postmodern age. In this series, you will find some of the world's leading intellectual authorities on educational leadership and change. From the pens of writers such as Dennis Shirley, Pak Tee Ng, Andy Hargreaves, Michael Fullan, Pasi Sahlberg, Alma Harris, Yong Zhao and Karen Edge, come wise insights and breakthrough ideas on this subject. They ask what the new imperatives of educational change are. They explore the paradoxical nature of educational change in celebrated Asian cultures and systems like those of Singapore. They point to the power of leading from the middle in schools, networks of schools and across the world, rather than just driving change from the top. They highlight the surreal nature of leadership and change at this critical moment in world history. This series of books is for the stout-hearted reader who is keenly looking for inspiration to unlock the potential of educational leadership and change in this turbulent world. Hargreaves, A., Lieberman, A., Fullan, M. and Hopkins, D. (Eds.). (1998). The Netherlands: Kluwer Publications. Hargreaves, A. (Ed.). (1997). 1997 ASCD Yearbook, Alexandria, VA: Association for Supervision and Curriculum Development. Hargreaves, A. and Evans, R. (Eds.). Buckingham: Open University Press. (1997). Fullan, M. and Hargreaves, A. (1996). New York: Teachers’ College Press. (also translated into Norwegian, Spanish, Swedish, Portuguese and Chinese). Hargreaves, A. Earl, L., and Ryan, J. (1996). London and New York: Falmer Press. (also translated into Spanish and Portuguese). Goodson, I. and Hargreaves, A. (eds.). (1996). New York: Falmer Press. Hargreaves, A. and Fullan, M. (Eds.). (1992). New York: Teachers’ College Press. (also translated in Greek). Fullan, M. and Hargreaves, A. (Eds. ), (1992). New York: Falmer Press. Hargreaves, A. (1989). Toronto: OISE Press and Milton Keynes: Open University Press. Hargreaves, A. and Reynolds, D. (Eds.). (1989). New York: Falmer Press. Hargreaves, A., Baglin, E., Henderson, P., Leeson, P., and Tossell, T. (1988). Oxford, England: Basil Blackwell. Hargreaves, A. (1986). New York: Falmer Press. Hargreaves, A., & Woods, P. (Eds.). (1984). Milton Keynes, England: Open University Press. Hammersley, M. & Hargreaves, A. (Eds.). (1983). New York: Falmer Press. Hargreaves, A. & Tickle, L. (Eds.). (1980). London: Harper and Row.